Still Alice is a movie about linguistics professor Alice Howard, who in her early 50's begins to forget words and places. After visiting her doctor, she is diagnosed with early onset alzheimer's disease, and faces the disease with the help of her loving family. I really enjoyed this film. It's an incredibly heartbreaking story, but doesn't make you cry, more just feel sympathetic and intrigued in the story. It's sad to see the slow process of the illness and how it begins to take over, but you also feel for her because she has such a loving, closely-tied family that keeps her going and helping each other through the way. The casting is really good, and I think Julianne Moore was fantastic. She definitely deserves the best actress oscar she won for this role. I thought Kristen Stewart was also really good as the youngest child who doesn't want to go to college even though her mum wants her too, it's nice to see that and isn't often shown in movies that much. It's a slow paced movie with lots of dialogue, but it has a really great and sadly real storyline that everyone can relate to in some way. I highly recommend it. 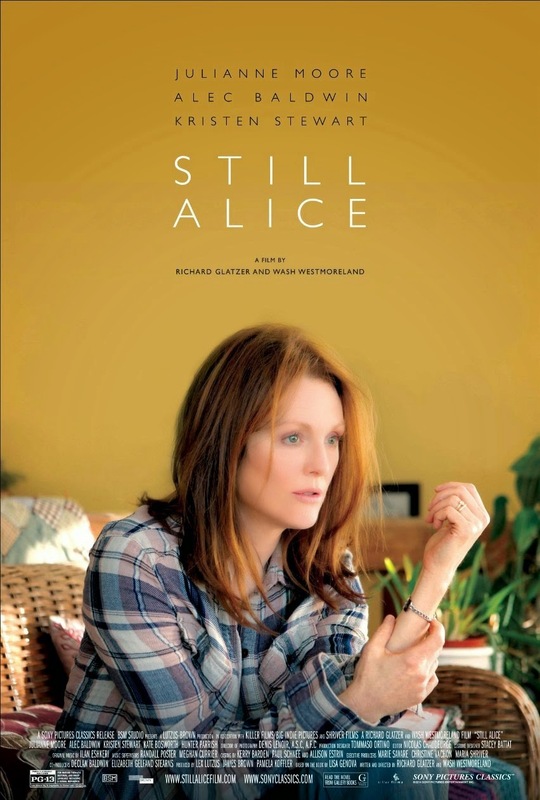 Have you seen Still Alice? What did you think?